When power went out for some half a million Mainers after the October windstorm, another system went down, too — Central Maine Power’s $200 million smart-grid communications network that, among other things, was supposed to improve outage communications and storm recovery. 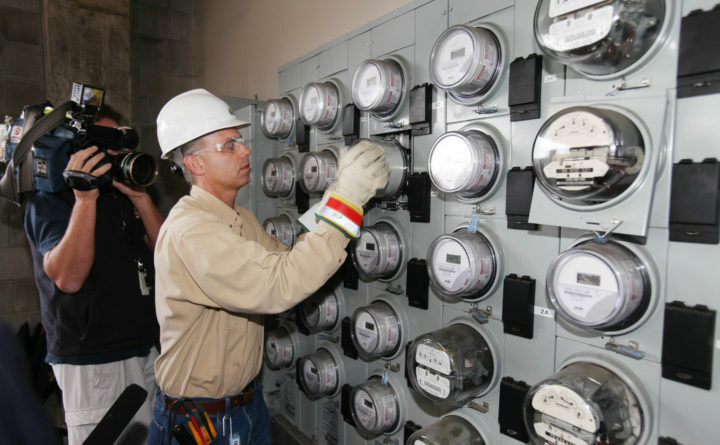 About seven years ago, CMP started installing new smart meters on more than 600,000 Maine homes and businesses as part of its Advanced Metering Infrastructure program. With roughly half of the AMI to be funded through a federal grant and half by customers, state regulators approved the investment because it promised a host of money-saving and other benefits. Those included automated meter-reading, saving money on human meter readers, on gas for their trucks and reducing the number of estimated meter readings. And it would help CMP remotely track outages, while sending automated texts or emails to customers about expected restoration times. Through the early innings of the windstorm that swept the state late Sunday, Oct. 29, CMP officials say, the meters did their duty, accurately charting the climb in outages, up to some 400,000 customers through that Monday morning. And then, at midday, the AMI system stopped reporting. “About 12 o’clock, 11:57, it just sort of flatlined. It stopped climbing and it was pretty clear we weren’t getting any more information from it,” CMP spokesman John Carroll said. By Tuesday the network’s performance was down by more than half. “We were blind in a way we hadn’t been in a very long time, and in a way we hadn’t experienced. So we don’t really see it in any way as a failure of the system. It’s certainly a learning, something we recognized. We’d never seen it crash before,” Carroll said. CMP’s customer communication systems were significantly degraded, with customers reporting inaccurate or spotty outage information and restoration estimates on the company’s website, through the smart-meter web portal and through email or text messages. The company couldn’t “ping” meters to verify their status. But CMP officials said it did not slow the actual storm response. “Having 405,000 smart meters not talking to us when they had no power doesn’t change how we manage the storm,” CMP CEO Sara Burns said. Burns said the smart-meter system has proven a valuable tool in managing the response to smaller outages. But this time, she says, just as would have happened in any big and damaging storm — and whether or not the smart-meter network was functioning — the company relied on traditional tools to assess damage and prioritize the response: calls from customers, automated calls to customers, staff field reports and meter checks. Choices were made, trucks rolled and crews got to work in what officials say proved to be the most widespread outages seen in the company’s 118 year history. As poles were repaired, lines re-energized and electric service restored, the smart-meter network started to come back, too. By Nov. 5, CMP says its Advanced Metering Infrastructure was 95 percent functional. And it’s at 100 percent today. But CMP’s critics are far from ready to dismiss the vulnerabilities the storm revealed. Berry is spearheading a legislative inquiry into the storm response by both CMP and Emera. The smart-meter system’s nonperformance, and whether that took staff away from other critical tasks, will be scrutinized, Berry said, as will the effectiveness of the utilities’ tree-trimming programs and other damage management tools. Even before that gets going, the state’s Public Utilities Commission next week formally opens its inquiry into the storm response. As part of that, the state’s Public Advocate, Barry Hobbins, says he is hiring a forensic investigator to document in detail how the response was managed. Hobbins, who has been briefed by CMP officials, cautions that it’s too early to draw many conclusions about what went right or wrong. “There was, obviously, a significant event that occurred that showed that the system failed. With the information that will be gathered through this investigation, I am of hope that this is one of the issues that will be brought into the forefront to make sure that our smart meters stay smart and don’t turn dumb when they’re not in operation,” he said. All stakeholders can be expected to consider ways to fortify the smart-meter system. Burns says there should be relatively inexpensive ways to do it. Many CMP customers are contending with one more effect of that loss. After nearly seven years of automatic meter readings, CMP has had to estimate bills for the period when the smart meters were down. That means customers are being charged based on the amount of energy they used during the same billing cycle last year. That estimate, of course, does not account for the period when customers were without power. CMP says any overpayments will be trued up and credited in the following billing cycle.